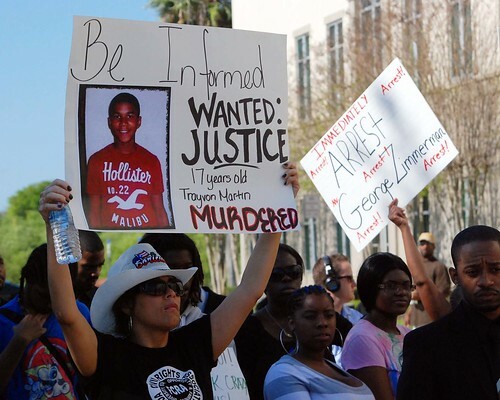 Less than a week after George Zimmerman was acquitted in the killing of Trayvon Martin, rallies were held throughout the United States calling for 'Justice for Trayvon.' Although a Sanford, Florida jury did not find Zimmerman guilty in Trayvon's death, millions of Americans feel that justice has not been realized in the case. In the aftermath of the shooting of Trayvon and its subsequent trial, a number of issues connected to this tragedy have been the focus of intense media coverage. Although many consider the era in which we currently live to be "post racial", the death of Trayvon has re-ignited national discussions on gun control, racial profiling, homicide rates of young black men and the differing views of the criminal justice system which exist within the white and black communities. If we have learned anything from the events surrounding the death of Trayvon Martin, it is that we do not all view the world the same way. Even within the Christian community, self-professed followers of Jesus Christ do not agree on who was at fault in Trayvon's death nor what justice looks like in the midst of the Zimmerman's acquittal. "A group of black and white Sanford-area pastors united by the shooting death of Trayvon Martin reconvened Wednesday for a racial-reconciliation forum they hope will spread nationwide. They hope Sanford, which did not experience violence after the acquittal of George Zimmerman, will provide a model for other cities. "I contend that Sanford, Florida, will be the place people will point to and say, 'These people have learned how to do it,'" said Raleigh Washington, president of the Denver-based Promise Keepers. About 30 ministers — including pastors from Atlanta, Los Angeles and Washington — attended the forum at Charisma Media in Lake Mary with hopes of launching a national Reconciliation and Relationship Initiative. The group drafted The Sanford Declaration, which could be used for multiracial forums in other cities. "Our real vision is to encourage this kind of dialogue all over the country," said Steve Strang, CEO of Charisma Media, who has scheduled a news conference today to announce the group's plans for the nationwide initiative. The press conference will be at 10:30 a.m. outside First Shiloh Missionary Baptist Church, 700 S. Elm Ave., Sanford. Key to The Sanford Declaration is a commitment to form friendships, fellowships and relationships between pastors that transcend race and culture. Several of the pastors said that without the death of Trayvon Martin, they never would have become close friends with ministers of a different race. "A horrible tragedy has brought us together, has slapped us upright and said there's a history here," said Joel Hunter, senior pastor of Northland, A Church Distributed in Longwood. "The inertia of history can only be interrupted by relationships." However, the Rev. Harry Rucker, pastor of First Shiloh Missionary Baptist Church, argued that Sanford remains essentially unchanged despite the closer ties between black and white ministers. "We're united, we're together, but racism still exists," Rucker said." "We often hate each other because we fear each other; we fear each other because we don’t know each other; we don’t know each other because we can not communicate; we can not communicate because we are separated." Christians of differing persuasions coming together for dialogue can help facilitate the healing in a racially divided community and nation. It doesn't mean we all have to act the same or think alike... or even agree with one another. But in order to be unified within the family of God, we need to be willing to step out of our comfort zone and listen to those different from us. I pray that this tragedy may become a catalyst for lasting unity among Christians in Central Florida...and beyond. To read complete coverage from The Orlando Sentinel on Trayvon Martin and George Zimmerman, please click here. What Is True For The College Freshmen Of 2013?